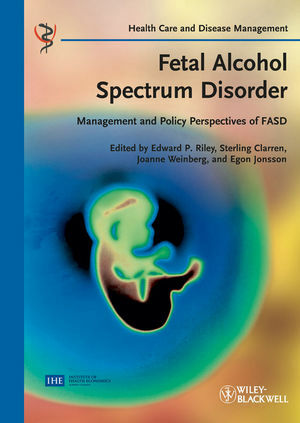 Reflecting the recent increased public awareness of the topic, this is the first and most comprehensive resource for over a decade on the molecular basis, prevalence, treatment options, socioeconomic impact and prevention strategies of FADS. Edited by world-renowned experts, this compendium includes the latest research results to provide new insights and realistic estimations of FADS frequencies in Western communities. An invaluable resource for every professional dealing with the diagnosis, prevention and treatment of FADS, from researchers via health professionals to social workers. Edward Riley is a Distinguished Professor in Psychology and Director of the Center for Behavioral Teratology, San Diego State University. Having received his Ph.D. from Tulane University he has spent most of his career researching the effects of prenatal alcohol exposure. He has authored over 225 scientific publications and has received numerous awards, including the Research Society on Alcoholism Distinguished Researcher Award, James Tharp Distinguished Researcher Award, and the National Organization on FAS Research Recognition Award. He chaired the US National Task Force on FAS/FAE between 2000-2004 and currently serves on the NIH Advisory Council on Alcohol Abuse and Alcoholism. Sterling Clarren is CEO and Scientific Director of the Canada Northwest FASD Research Network and Clinical Professor of Pediatrics at the Faculty of Medicine of the University of British Columbia; Clinical Professor of Pediatrics. Joanne Weinberg is Professor and Distinguished University Scholar in the Department of Cellular & Physiological Sciences at the University of British Columbia. She obtained her B.A. from Brown University, an M.A.T. in Natural Sciences from Harvard University, and a PhD in Neuro- and Biobehavioral Sciences from Stanford University Medical School. After Postdoctoral research at Stanford, the University of California, San Francisco, and the University of British Columbia, she joined the Faculty of Medicine at UBC in 1982. She has published more than 125 scientific papers, chapters and reviews, and has received numerous honors and awards, including UBC Killam Research and Killam Teaching Awards, the Henry Rosett Distinguished Investigator Award from the FASD Study Group of the Research Society on Alcoholism, and a MERIT award from the National Institute on Alcohol Abuse and Alcoholism. Egon Jonsson is director and CEO of the Institute of Health Economics, and professor at the University of Alberta, public health sciences. For 20 years he was a professor of health economics at the Karolinska Institute, Stockholm, Sweden. He was also director of the Swedish Council on Health Technology Assessment (SBU), worked for WHO Euro, and was a health policy advisor at the ministry of health in Hanoi, Vietnam. He has co-edited two successful Wiley-VCH titles during his time at SBU: "Treating and Preventing Obesity" and "Treating Alcohol and Drug Abuse".